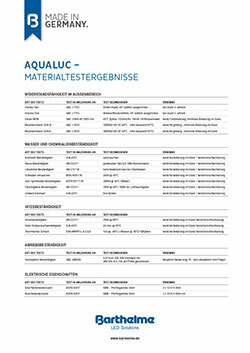 The AQUALUC family has been extensively tested with regards to resistance to salt, water, UV radiation, chemicals, abrasion and stone splitters. The high quality composition of the coating material, consisting of ceramic and polyurethane, enables a high protection class of IP 67/68. As a result, the AQUALUC series is ideally suited for numerous interior and exterior applications: from pool and wellness, garden and landscaping, through to architectural lighting, maritime lighting and many more.